The Kwa languages constitute a branch of the Niger-Congo phylum spoken in the southern region of West Africa from Côte d’Ivoire to Nigeria. They are known for their isolative morphological structure and their complex tonology. 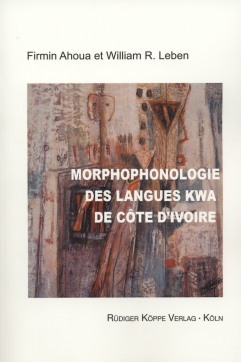 The book deals with the morphophonology of the Kwa languages of Côte d’Ivoire as it interacts with syntax and phonology. Included are analyses of the tonal systems and prosodic domains over which the various regularities hold. Some data for this volume were elicited directly, but most are from a set of oral tales and monologues, published separately as Contes et textes documentaires kwa de Côte d’Ivoire (see link at the bottom). The analyses are offered as a contribution to the comparative study of a relatively poorly known set of languages, some of them highly endangered, and to the study of language typology in general.